When one thinks about cryptography or encryption in World War II, the first thing that comes to mind is the Enigma Machine used by the Nazis, whose code was broken by the Allies and used as a secret tactical advantage. But what many people don’t know is that just before World War II, the Japanese also developed a series of encryption devices that improved upon the Enigma Machine and were used to transport their top level military secrets. Here's the unknown story of how U.S. intelligence was able to crack the Japanese Purple Machine. Upon the trust of Hitler and other German officials, Japanese Baron Hiroshi Oshima bought a commercial Enigma Machine from the Germans in hopes of developing a new version for the Japanese. This effort resulted in the creation of a new “enigma machine,” code-named “Red” by the Americans. The Japanese Navy used it from about 1931 to 1936, when the device’s cryptographic method was broken by the U.S. Signal Intelligence Service. Unfortunately for the U.S., the decryption of Red was not kept very secret and the Japanese became suspicious. Soon after, the Japanese began creating a new system to encipher their messages. In 1937, the Japanese created the “97-shiki O-bun In-ji-ki” or “97 Alphabetical Typewriter,” named for its creation on the Japanese year 2597. This device was better known by its U.S. code-name, “Purple”. The Purple Machine was made up of two typewriters as well as an electrical rotor system with a 25 character alphabetic switchboard. Like the Enigma Machine, the first typewriter was the method in which the plaintext, or unencrypted message, could be manually inputted. The typewriter was built to be compatible with English, Romaji, and Roman, adding a level of mystery through language choice. 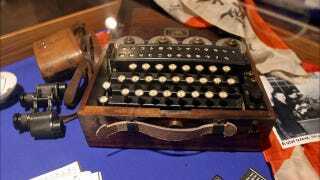 But unlike the Enigma Machine, which presented the text in the form of blinking lights, Purple used a second electric typewriter, which would type the cipher text, or encrypted message, onto a piece of paper. This was a huge advancement to the Enigma Machine, which would require two people to operate (one typing and one to record the projections) because it only required one person to operate and would reduce human errors. The only drawback to this was in the increased size and weight of the Purple Machine, which rendered it unsuitable for use in combat locations. The Purple Machine enciphered the messages with the use of its four rotors and switchboard. Like the Enigma Machine, the machine would not only have an unknown method of encryption, but also a secret key that was changed on a daily basis. This meant that even if a Purple Machine was stolen, it would be useless without the key of the day. Additionally, as the key changed every day, code breakers would not be able to find patterns in messages sent over several days. The daily key would be inputted into the device by the arrangement of the switchboard and rotors. The switchboard contained 25 connections, which could be arranged into 6 pairs of connections, yielding over 70,000,000,000,000 possible arrangements which would determine the method of encryption. Not only that, the rotors could be arranged in various starting positions that would also vary the encryption method. The rotors of the machine were “stepping-switches,” which would rearrange themselves as each letter was inputted and scrambled the alphabet used for the next letter. The Purple Machine would use hundreds of thousands of cipher alphabets before it would repeat one, thus eliminating any obvious patterns in the cipher text. This made the Purple Machine — just like the Enigma Machine — exceptionally difficult to crack. In order to decipher a message, the switchboard and rotors would need to be set with a key inverse to that of the key used to encipher. The cipher text would then be plugged into the first typewriter and the machine would type the plaintext. The Purple cipher was used to send secretive messages overseas mostly to diplomats and military officials in Washington, Berlin, and London where Japan did not want unintended recipients snooping around. Breaking the Purple Machine was a daunting task for many reasons other than the complexity of the code itself. While trying to break a code, the more cipher text the code breaker has, the easier his/her task. As the messages were being sent into the U.S. and England, it would have been easy for the governments to seize the messages. Unfortunately, because the machine was new and still not mass produced, only the most secret military messages were being sent, and code breakers had a very limited amount of cipher text to work with. However, because the code senders were inexperienced with the new system, some messages were sent in both the Purple cipher as well as the broken Red cipher, making it possible for the texts to be compared. Additionally, as time passed, the Purple code was used more often and the U.S. had a plethora of cipher text to work with. In 1939, cryptography expert William Friedman was hired by the U.S. Army to work on breaking the Purple cipher. Eighteen months into his work Friedman suffered a mental breakdown and was institutionalized. Fortunately, he was able to make some progress before this and, using his incomplete work, other members of his team were able to make continued progress. A substantial chunk of the code was broken, and even though a Purple Machine had never been seen by American code breakers, eight functional replicas of the Machine were created. Eventually, Purple Machine’s method of encryption was completely discovered. This, however, did not mean that the messages could be broken because the daily keys being used were still a mystery to code breakers. The Purple Cipher was one of the most complex and well developed cryptographic methods of its time, and although it was eventually cracked, it kept top secret Japanese messages from prying eyes for almost two years during World War II. After a great effort by U.S. cryptanalysis the code was broken and used against its makers, tracking Japanese Naval troop movement as well as other military communications. Unlike the Red Cipher, the U.S. tried taking full advantage of this by keeping it a well-guarded secret from the Japanese and its allies so that the messages would continue to be sent in the broken code. The U.S. ceased and broke a multitude of Japanese secret messages, even some containing the plans for the attack on Pearl Harbor which could have been used to prepare. However, as history reveals, not all of these were used to their full potential. Sources: Balciunas, Marijus. (2004). Japan’s Purple Machine | Japanese Purple Cipher. Cipher Machines | PURPLE, CORAL, and JADE. This post originally appeared at Wonders & Marvels. It's also part of a series of essays on the history of cryptography produced by students at Vanderbilt University. The students wrote these essays for an assignment in a first-year writing seminar taught by mathematics instructor Derek Bruff. The essays are shared here, in part, to give the students an authentic and specific audience for their writing. For more information on this cryptography seminar. Images: Duke University, Edwards Air Force Base.